We were originally going to eat at Boldo Bol in Santa Ana, but once we saw the food, we changed our mind. We had to decide quick as where to eat. It was between Seabird and Wheat and Sons. My husband picked the former and with reluctance I obliged. The problem with this vegan restaurant is that a lot of their menu is carb heavy and not the good kind. Putting brown rice in your bowl is so passé. There is so many ancient grains out there that are good for you, so use them. I was glad that there were a few new menu items that we could try. Their falafel was fried right and had a kick but I didn’t taste any coriander, an important spice for falafel. It was a little pricy for the mostly romaine salad. 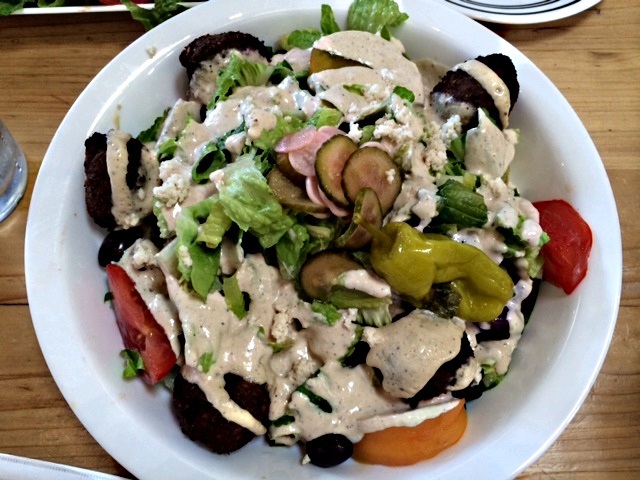 The falafels were small and you needed a couple more to be satisfied. This salad appealed to me because it is the kind of salad I make myself at home. We enjoyed the charred watermelon and the heirloom tomatoes, although not perfect, were on the sweet side. I really enjoyed the fragrant mint and the crunchy pistachios. The only flaw was the dressing because it was on the sweet side. My husband took a bite of this salad and went silent. I asked what was wrong and he said it was too sweet. I said noo, if it is too sweet for him, it will be a sugar coma for me. The salad came with unripe tasteless peaches. 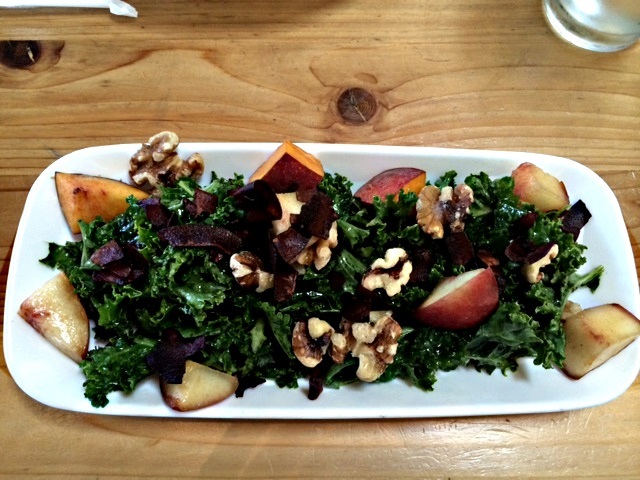 If your main star of the salad is stone fruit, you better make sure it is ripe. The dressing was overwhelmingly sweet. It was painful to eat it and we should have sent it back. I asked one of the servers what was in the dressing and she responded, orange juice and agave!! Really, two sugary ingredients. Where was the balance. If you can not make a proper vinaigrette to suit your salads then you have to take some lessons to improve yourself. 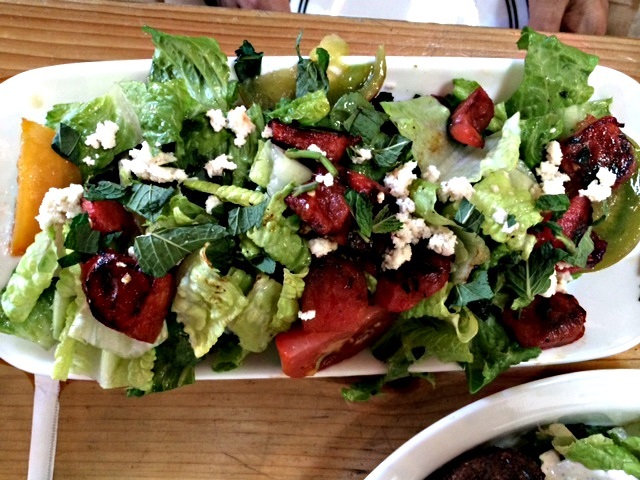 The only saving grace in this salad was the salty coconut bacon and the crunchy walnuts. Needless to say I won’t be coming back here anytime soon. 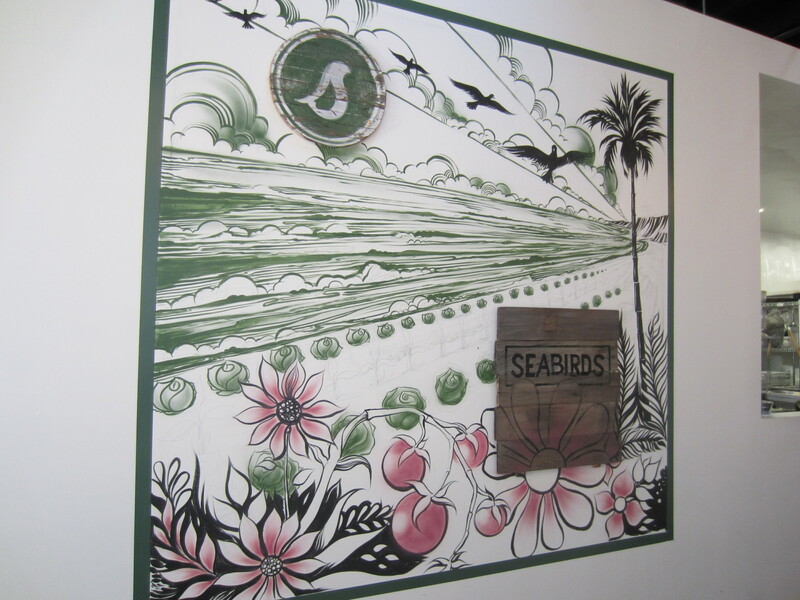 Every time we went to SOCO to get our Mexican fix at Taco Maria Truck we noticed there was a long line at the Seabirds food truck for their vegan food. They recently opened their brick and mortar café at the Lab in Costa Mesa. I got the Holy Smokes Bowl. 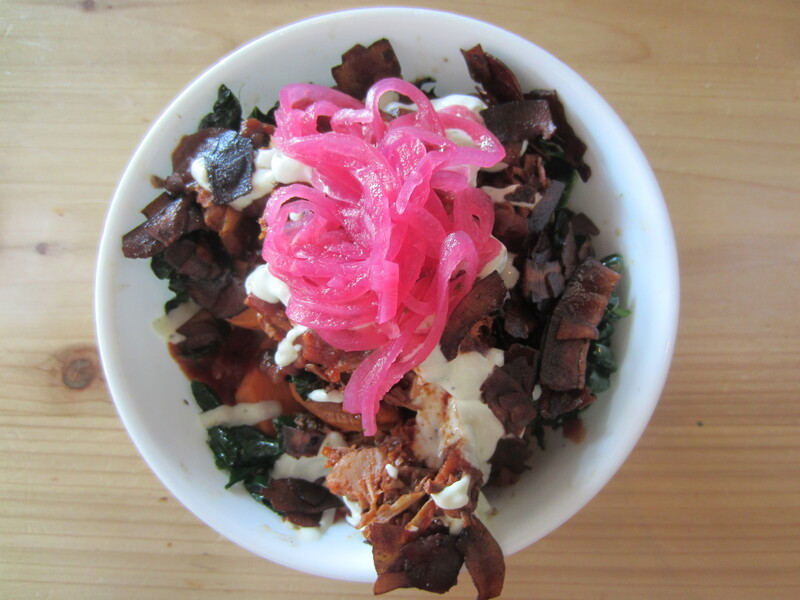 This bowl was on the sweet side and it came with Brown Rice, bbq Jackfruit, sautéed Greens, Yams, pickled Red Onion, Coconut Bacon, Seabirds Sauce and Kentucky bbq Sauce. It was a very flavorful bowl. The bbq Jackfruit was sweet and luscious. I was curious about the Coconut Bacon and it was coconut flakes that looked like bacon. The yams were not cut uniform and because of that some pieces were soft and some were on the hard side. I just wish that they used Quinoa or another super grain instead of the boring Brown Rice. My husband had the Peruvian Ensalada. I laughed when I saw the plate. 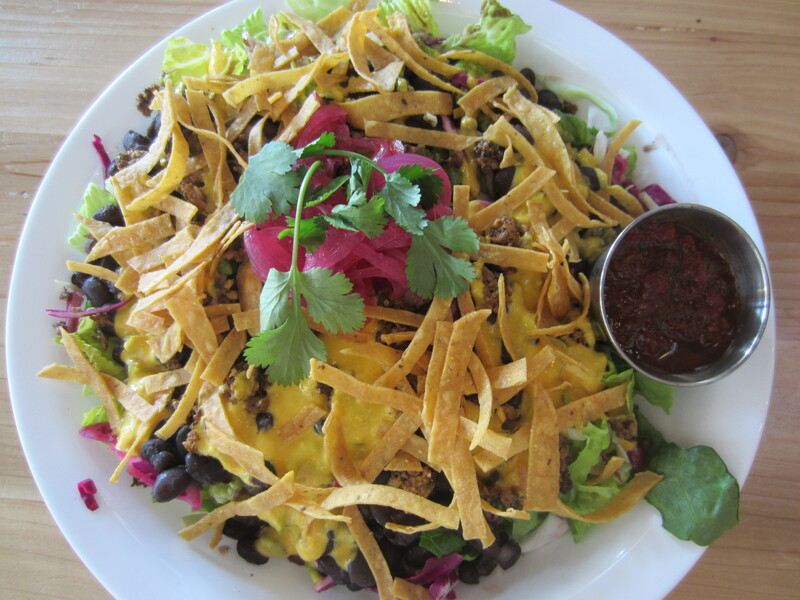 It looked large and it came with Nut Chorizo, Black Beans, Aji Pepper Crema, Limed Cabbage, pickled Red Onion, chopped Romaine hearts, Tortilla strips, Cilantro and Ancho Salsa. He really liked his bowl, but after gardening he could have used more protein. I felt the bowl was a little over priced considering the ingredients. I noticed a lot of people were eating the Beer Battered Avocado Tacos. It looked fine, but not much nutrition there. I would recommend this place to my vegan friends and family.